“What will you learn from its mysteries? Has it not already given you enough dark secrets? Secrets that could destroy your world? What lies in the cauldron now you have done away with the knowledge of wise women? Split the witches in half? Killed the giants? Driven to the seas the most ancient of boars? You are on the wrong quest, looking for the wrong grail, the cure-all that does not exist. If only Arthur and his plundering/blundering rogues heeded the spot on advice of the Head of Annwn, the infliction of so much grief and devastation could have been averted. Sadly, careless murder and inhuman cruelty employed to seize resources still dominate our national priorities, millennia since these warning tales came to be told. Brythonic Poet Lorna Smithers, taps into some serious Awen to demonstrate the urgent contemporary relevance of these teachings from the Mabinogion, in her compelling new book, The Broken Cauldron. Its brief 102 page journey covers an extraordinary range of material in various voices and formats, and rewards repeated readings. Mirroring the chaos unleashed by Lleog’s sword, myth fragments, poems, personal stories, synchronicities and contextual mashups build the book’s structure to create a bracing mix that educates, entertains, and inspires. Her scholarly curiosity leads the reader through an accessible mix of chemistry, archeology, geology, sociology, poetry, history, and linguistics, weaving resonant trends through the entire work. “Whilst Taliesin is venerated by Druids as the spirit of the Awen incarnate, slipping effortlessly between worlds and forms, little attention is paid to the cost his theft exacts on the land and its inhabitants. Instead of focusing on marquee figures Arthur and Taliesan, Smithers rebirths the marginal and side figures in the tales, giving clear voice to under-drawn characters such as Hygwydd and Afagddu. Many old Northern European tales survived as entertaining heroic epics for feasting warriors. By shifting the narrative from applauding avaricious adventuring in the service of empire, she exposes richer sources of meaning within the tales. “… the splitting and bottling of magical women for over a thousand years. Draining of our blood. Boiling of our flesh. Testing if we float. Giving us The King James Bible and The Malleus Maleficarum. Taking away our prophecies and visions, gods and goddesses, our fighting strength. Confining us to virginity and chastity belts. Cutting us off from plants and spirits, rocks and rain, rivers and mist, other worlds. “we have broken the jars. by the tyrants of Arthur’s court. Not the trawling. But the way I continue to live a life I know is absurd, supporting the unfair structures of establishments I do not believe in (white noise in my mind, cotton wool in my ears), not listening, not remembering, knowing it’s wrong, as my truth slips away like a distant ship and I’m left in a world that is paper thin? Remember the voices of the gods. Later, Smithers inhabits one of the Nine Maidens, who can no longer abide raising battle dead for sake of continued fighting, and sabotages the process. 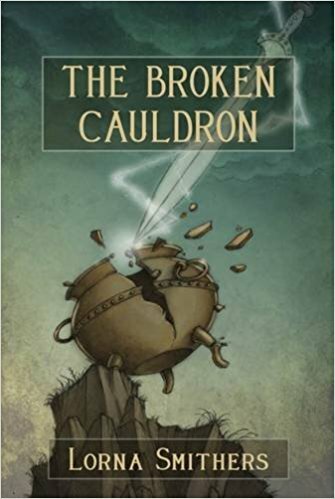 An adroit shift in voice/character reveals Ceridwynn’s son, Afagddu, and his reframing of the Cauldron’s destruction as a contemporary chemical spill. An inspired contextual twist takes Arthur’s servant, Hygwydd, to the chemical weapons battlefield horrors of World War I Europe. Shape shifting to a raven, Afagddu relates the chilling and unsavory true story of a vile sea based lab that tested chemical and biological weapons on animals. They ineptly exposed a passing ship to plague virus. Rather than immediately quarantine the exposed crew, they were instead monitored in secret and allowed to mix with people where they made port! The gag order came from no less than Churchill’s proxy. And, the program that tested the pathogens at sea? Operation Cauldron. What begins in a starry cauldron, ends with a science lesson describing the birth of uranium in star burst. She juxtaposes the knights’ abuse of the underworld with the brutal process of uranium mining. A fascinating sidetrack gives the reader a view of 2 billion year old fission reactors that have developed naturally in West Africa. Of the 17 that withstood time, only one remains, the rest mined out of existence by the French. Lorna Smithers’ bardic fire burns away the blinders. Her non-linear narrative and graceful facility changing voices whet the attention while building her thesis with steady momentum. Her poetic skills create a language with a rolling resonance, like a spell, that breaks with the timeline ending at some future point that she casts as a new beginning. The book is a pleasure to read, grounding exhaustive scholarship with crisp sensual detail. She’s not only studied the language of Myth, she speaks it.